Salespeople are happiest when they’re selling. Sales managers are happiest when their salespeople are selling. CEOs? Same thing. But as any good salesperson knows, they’re far more effective when they have resources that help them communicate value to prospects. That’s where sales enablement comes in. Instead of having your salespeople stop to work on presentations, collateral, blog posts, and emails, wouldn’t it be better if they had access to a library of dedicated resources for that? That’s what our sales enablement services provide. By getting an understanding of your market and target customer, we can take existing marketing resources and repurpose them for sales. Beyond that, we can develop sales-exclusive resources. Need sales content to share via emails? We can do that. Sales enablement services a good fit for companies that have five or more salespeople and need to provide salespeople with dedicated resources. 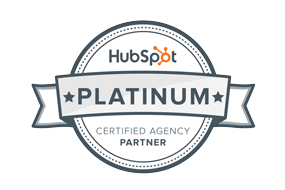 If you have HubSpot’s Sales Pro for your team, we definitely want to talk to you. Your salespeople need to be busy selling, but they also need resources to support them. Case studies, videos, testimonials, educational content, blog posts, and email templates all save your salespeople time. If your sales process isn’t consultative, or is just a numbers game, sales enablement isn’t going to do much for you. If you don’t have a strong tracking process in place (via your CRM), it’s going to be difficult to see what’s effective and what isn’t. Sales enablement starts the same way inbound marketing content does. We need to understand your ideal customer, what they care about, how they buy things, what they like and don’t like, etc. We’ll want to chat with a few of your best salespeople as well to learn where they run into friction in the sales process. From there, we’ll begin to develop a wishlist of sales enablement resources and work with your team to prioritize their creation. For new clients, it can take up to a month to complete our research and strategy. From there, we’ll work with you to determine what mix of resources you need to have developed monthly, and ensure that we’re tracking metrics on them for optimizations. We’ve worked with many growing companies on programs just like these. Plus we get content. A lot of content that you create for marketing can be repurposed for sales, but it’s important to know the difference in context. We get that, and design our sales enablement to continuously support sales teams.